Awareness Depot Blog | Raising awareness one blog at a time! This week I was given the news that my father’s cancer is back. Working here at awareness depot, I receive many phone calls like this; My father has cancer, my brother has cancer, my husband has cancer, I have cancer, and the list goes on. It seems we all know someone who has or has had cancer. No doubt it is a horrible disease. This is why we can empathize with all of you when it comes to this cause. So this week, I am back to wearing the periwinkle awareness ribbon that we carry. This stands for stomach cancer. We have a list on our site to help you figure out what cancer goes with what color. Just click here: https://www.awarenessdepot.com/code1.html to help you. We have pins for most all cancers and they are very reasonably priced. I wear mine to remind myself that we are in this together…as a family and as a community. Cancer ribbon pins are easy to pass out to family and friends and many times we run specials to help with pricing. Here is a link to join our newsletter so you too can keep up with our specials https://www.awarenessdepot.com/ (It’s the purple box on the bottom left hand corner of our homepage). Here are just some colors of pins we carry. 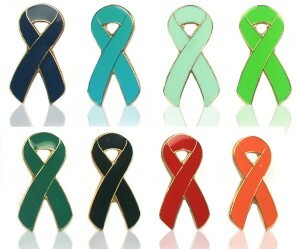 You can visit our pins page at https://www.awarenessdepot.com/awarenessribbonpinallcolors.html to get more information. Stay safe everyone. Be aware – talk with your doctor about Prostate Cancer! September is fast approaching. Can you believe it?) and we’re getting ready around the office to help raise awareness of Prostate Cancer. Prostate cancer is a cancer of the prostate, part of the male reproductive system. There is currently a lot of controversy about best practices in screening for this cancer due to the fact that it is usually slow-growing. HOWEVER, there is agreement that you should definitely discuss your risks for Prostate Cancer with your physician and discuss what screening is appropriate for your situation. The biggest threat from prostate cancer comes when you ignore the warning signs and don’t speak with your doctor. Our prostate cancer awareness items are intended to help raise awareness of this disease and to support the families of those fighting it. In addition to our great prostate cancer magnets and ribbon pins, we have a new prostate cancer khaki cap – a great gift for the guy in your life! Where has the summer gone? It seems like just yesterday the kids were getting out of school and the weather was warming up – it’s hard to believe that September will be here in TWO SHORT WEEKS! Awareness Depot has stocked up on our Leukemia & Lymphoma Awareness products – you still have time to order what you need for your September events and get it in time! Still wondering what you should do? We recommend our Leukemia Ribbon pins, which are a great way to say thank-you to volunteers or to show your support every day. These are also available in lime green as Lymphoma Awareness Ribbon Pins. Of course we have great Lymphoma Ribbon Magnets and Leukemia Ribbon Magnets, but what’s really exciting our our new Chrome Emblems. These chrome ribbon emblems look GREAT on your car – they’re a super classy way to show your support for one of these causes and they make great gifts, awards and auction items. Check them out: our Lymphoma Chrome Emblem and our Leukemia Chrome Emblem. As always, if you have any questions, concerns or if you need help ordering for your event or fundraiser don’t hesitate to give us a call toll-free at 866-982-3524. We at www.AwarenessDepot.com agree that true love and compassion aren’t easy to ignore. This week, a 24-year-old Redditor shared a letter received just after the death of his mother. The event, despite being difficult, brought an unexpected source of condolence — a personal note from a physician who had never contacted a patient’s family before. According to the Redditor, his mother had breast cancer. A month ago, breathing difficulties landed her in the hospital, and 16 hours later, she passed away. Surprisingly, the doctor who wrote the letter had never met or treated his mother until that day. “If my mother were alive to see this, she would want readers to reflect on the power of showing compassion towards a total stranger,” he told HuffPost. “The support I got from Reddit was amazing — doctors, nurses and other Redditors who have lost their mothers to cancer were all shocked and amazed that the doctor took the time to write such a heartfelt, meaningful letter,” he added. I am the Emergency Medicine physician who treated your wife Mrs (removed) last Sunday in the Emergency Department at (hospital). I learned only yesterday about her passing away and wanted to write to you to express my sadness. In my twenty years as a doctor in the Emergency Room, I have never written to a patient or a family member, as our encounters are typically hurried and do not always allow for more personal interaction. However, in your case, I felt a special connection to your wife (removed), who was so engaging and cheerful in spite of her illness and trouble breathing. I was also touched by the fact that you seemed to be a very loving couple. You were highly supportive of her, asking the right questions with calm, care and concern. From my experience as a physician, I find that the love and support of a spouse or a family member is the most soothing gift, bringing peace and serenity to those critically ill. I am sorry for your loss and I hope you can find comfort in the memory of your wife’s great spirit and of your loving bond. My heartfelt condolences go out to you and your family. All of us at AwarenessDepot.com would like to wish everyone a very happy New Year! 2012 was a very eventful year and a successful one too. We now usher in 2013 and hope that it brings much more success, love, and happiness. Start the New Year off right and head on over to AwarenessDepot.com and raise awareness for the cause that is most important to you, a relative, a friend, an organization, or event. Happy New Year! Autism Spectrum is a label that has been given to Adam Lanza but no one has been able to link his Autism to the senseless acts of violence he committed. Yet that hasn’t stopped many from profiling those with Autism and Aspergers when things like this happen. Although it is true that many with Autism seem to lack personal empathy, empathy is also something that can certainly be taught and learned through years of good parenting and positive activities aimed to reinforce it. In a time like this, its understandable how many people are trying to find answers but to put a spotlight on Autism and try to use that as an excuse for that kind of violence can be borderline ridiculous. To many in the Autism community, this can be quite insulting because this can easily lead to unnecessary profiling. Now is a good opportunity for society to look even closer at Autism and learn even more about it and how certain behaviors are linked to it. Those trying to make a case out of Adam’s Autism are either looking to make a name for themselves or just don’t know any better. At the end of the day, parents take on the biggest responsibility when it comes to children, teens, and even grown adults with Autism. Therefore, if there is ANY blame for what happened, it should be shifted to everything happening in and around Adam’s life instead of his Aspergers. All of us Awareness Depot and AutismThings.com would like to express our deepest condolences to the families affected by this tragedy. If there is a time where change is needed in this country, it is definitely now. Autism doesn’t kill, guns were made to and that’s where society needs to focus their efforts in making a positive change. 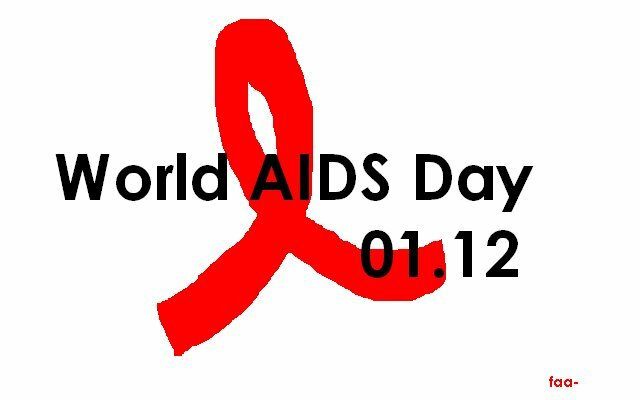 Every year, World AIDs Day is held every December 1st in order to raise worldwide awareness for this deadly epidemic. World AIDs Day is an opportunity for people to unite globally and fight against HIV, support those who live with it, and remember those lost in the battle. It’s an important reminder that AIDs has not gone away and that it is still a serious issue in today’s society. So what should one do on World AIDs Day? Simply learning and educating yourself on the disease and putting that knowledge to action in order to help raise awareness for those who don’t really know any better. Just having knowledge of AIDs is enough to keep you a healthier individual. We at Awareness Depot want to show our support for AIDs by offering a special sale on all AIDs awareness items. We carry everything from the signature red ribbon pins to red silicone bracelets. Stop by our online store today and input the coupon code WORLDAIDSDAY2012 during your checkout to receive a 10% discount of your purchase. Visit us today and take advantage of our discount and help raise awareness for AIDs. These make great gifts for Dads of any age, or for grads or moms as well! These comfortable, awesome hats are available in a variety of awareness ribbon styles – including those most dear to the man in your life. We’ve got Prostate Cancer Awareness Caps, Colon Cancer Baseball Caps and – because real men wear pin – Breast Cancer Awareness caps. That’s just a small selection – make sure to check them all out, and if your favorite cause is missing, let us know and we can help you get one. Dad loves a cold beverage, especially after working hard in the yard or a long day at work. With our ‘cool’ Coolies, his cold beverage can linger in his hand without loosing it’s cool. Hahaha. I’m pun-ey. These lanyards are perfect for Dad’s work badge, the See-Do keys or (what we use them for) keeping the keys to the truck bed/ Snug-Top cover easy to find. They’re also a GREAT way to show your support for whatever awareness cause is close to your heart. These are AwarenessDepot.com’s exclusive item, but we’ve got them in every color from pink to lime and back again. The end of the school year is almost here and AwarenessDepot is excited to offer a whole new selection of great gift ideas for the teacher, aide, mentor or therapist in your life! As parents and teachers ourselves, we know how important a great teacher can be in a child’s life and development. We also know how hard teachers work and how little support they sometimes get. In addition to our popular “I teach children with Autism” t-shirt (seen here) we’ve built out a whole Teacher section on our website. If there’s something you’re looking for but don’t see here yet, don’t be afraid to ask! Wear Blue for Autism On April 1 & 2! AutismSpeaks.org, one of the Autism Organizations that we donate to, is doing a huge promotion this April 1&2 to help raise awareness of the growing problem of Autism in our world. To celebrate this day, prominent buildings across North America and the world — including the Empire State Building in New York City The Miami Tower, the Port of Miami in Miami-Dade County and the Christ the Redeemer Statue in Rio de Janeiro, Brazil , — will turn their lights blue to raise awareness for autism and to commemorate the fourth World Autism Awareness Day . Their aim is to light the world blue all throughout April — city by city, town by town — by taking action to raise autism awareness in our communities. Take a moment to View the Light It Up Blue Video, it show us how impactful this campaign is, it really brings the world together on this issue. Get your friends, family, employees and neighbors to wear an Autism Bracelet in April and help raise awareness! We’ve got a great price on these awesome bracelets. Click here to shop now!